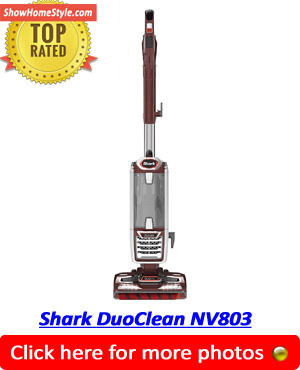 Are you searching for the best above ground pool vacuum cleaner? Do you need a pool vacuum that is reliable, super easy to use and requires very little maintenance while still getting your above ground pool clean and ready for swimming quickly and effortlessly? After looking at 23 models and carrying out in-depth research, we have determined that the best above ground pool vacuum is the Dolphin Escape. Finally, you can buy an above ground pool vacuum that actually works as described. You really can set it up and walk away knowing that you will return to find a spotlessly clean pool. This pool vacuum does not stumble over drain covers it just powers on and cleans right up to the edge. It picks everything up including leaves that are stuck to the bottom and even small stones. Best of all, it requires very little maintenance and is made by a dependable manufacturer. This is tried and tested technology. As you will see, it also has excellent user reviews. 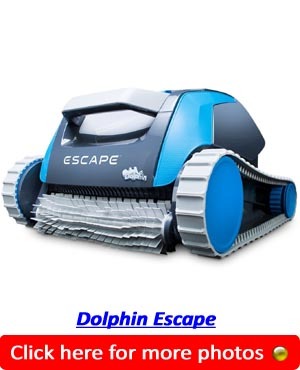 The Dolphin Escape is an extremely user-friendly above ground pool vacuum cleaner. Ready to go in 5 easy steps. All you need to do is uncoil the lead, plug it in, place the cleaner on the surface, turn it on and let it float to the bottom. Watch it for a moment to double check that everything is OK, then walk away and go and do something else. This underwater vacuum cleans fast. In an hour or an hour and a half, depending on the size of your above ground pool, you can return to a completely clean pool. The Hyperbrush technology combined with its powerful 24-volt dual motor means that it cleans up algae, leaves and other debris completely from all over your pool. Customers who purchased the Dolphin Escape loved the fact it was super easy to maintain. All you need to do is to pull it from the pool, empty the top-loader debris canister, hose it down, pop it back in and shut the lid. Then, just turn it upside down and stow it away in a frost-free environment. There is no need to change icky filter bags, something which saves you both time and money. The Dolphin’s oversized collection cartridge holds 60% more debris than similar models. The unit weighs just 14 pounds and is compact making it really easy to lift up over the edge of the pool. Accidentally knocking over your poolside pots and ornaments is not going to happen because there is no super-long, unwieldy pole to deal with. It is a remarkably small unit that will not take up very much space in your shed either. Pool cleaners rarely come with the option to buy extended warranties. The Dolphin Escape does, which is a good sign. It means that the manufacturer has a lot of confidence in its product. You can either settle for the one year warranty that is included as standard or buy a further four years. Some customers found that this unit, like virtually every above ground pool vacuum, struggled with picking up fine particles. However, this issue can easily be solved. You just need to buy a finer mesh filter container. Of, if you prefer, manually vacuum the pool to get rid of the buildup. Usually, you will only have to do this once. After that, provided you use it regularly enough, the Dolphin Escape Robotic cleaner will stop these ultra-fine particles from building up again. 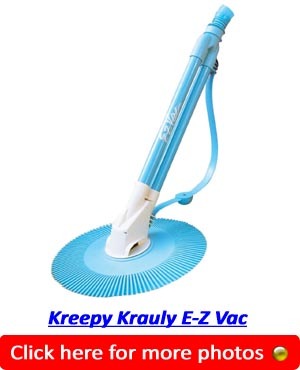 Kreepy Krauly has been making above ground pool cleaners since the late 70s. This latest model goes back to the original tried and tested design, something a lot of users seem to have welcomed. Included in the package is a 32ft hose. Unfortunately, a few users experienced splitting and not always after it had been exposed to the sun and chlorine for a while, which is normal. Hopefully these were isolated incidents, however you can buy replacement hose if you have any problems. The simple design and construction mean that very little can go wrong with the head of this vac-suction side pool cleaner. That part of the assembly only has one moving part. But, there are other problems. To start with, connecting it up to your pool and getting it to function properly is not always straightforward. You may need an adapter to get a good enough seal between your skimmer and the vacuum hose. Sometimes you can get it working efficiently, other times no matter what you try it is just not reliable. So, it is not suitable for all pool owners. Plus, getting hold of Pentair can be difficult. Sometimes they answer and resolve the problem straight away, but not always. 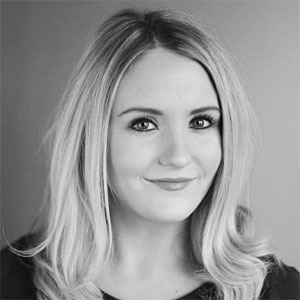 However, there is a big community of long-term users and sometimes their tips will solve the issue. Simple things like topping the pool up before trying to use it can make a huge difference to how efficient this cleaner is. 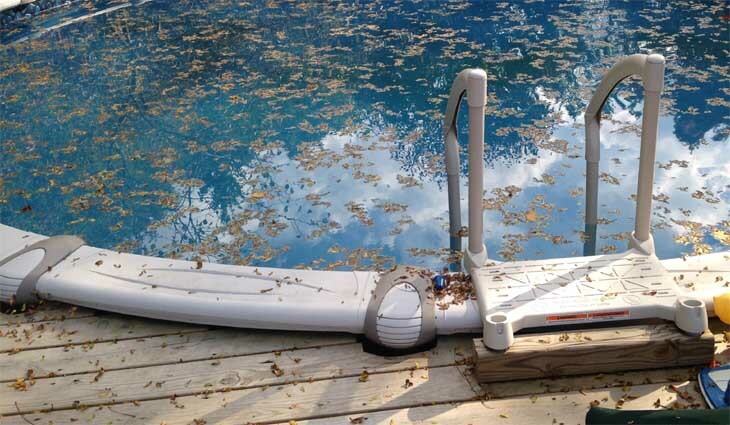 The Kreepy Krauly E-Z cleaner from Pentair is not recommended for use in above ground pools that have pumps that are smaller than 3/4 hp, So it may not be suitable for all above ground pool owners. Once you do get it working it is extremely efficient. The rubber skirt really does funnel dirt into the path of the suction pipe. If you are on a tight budget and have a powerful enough pool pump strangely, this could actually be the right choice for you. 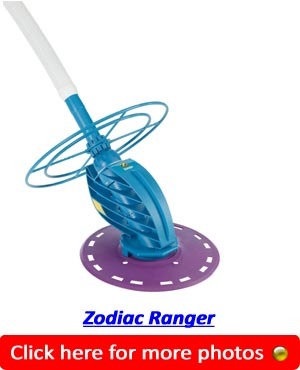 The Zodiac Ranger is another simply designed above ground pool cleaner. It comes with a 32ft hose, which is more than enough for most domestic pool owners. It is one of the few above-ground pool cleaners that is designed to clean pools with dished out bottoms. The manufacturer says that it can be used in this type of pool with a depth of up to 72 inches. However, it cannot be used in Intex or soft-sided pools. The Ranger is pre-assembled, which is handy, especially for those of us who are not good with tools. All you need to do is to take it out of the box and attach the hose and plug it into the inlet. The UPVC collar is sturdy, but, a bit stiff, which makes it hard to fit into some inlets. The Deflector Wheel is an interesting innovation that is designed to stop the device from getting caught up on steps or getting stuck in a corner. Some users say it works, while others said that their unit regularly gets caught up on the steps. In some cases, users were able to solve this problem using the weights that are provided. Even people who were mostly happy with this automatic pool cleaner said that it regularly missed the same bits of the pool. Sometimes you can solve this common pool vacuum issue simply by adjusting the hose. However, you may have to occasionally go over the worst bits using your manual pool vacuum. If you are looking for a relatively cheap cleaner that will get most of your pool clean the Zodiac Ranger may be OK for you. This has got to be the strangest looking pool cleaner on the market. As the name suggests, it looks like a little bug, kind of cute in its own way. But, don’t be fooled, it is a surprisingly good above ground pool suction cleaner. Many users love theirs, although it has some bugs (excuse the play on words). This innovative robotic pool vacuum features SmartDrive program steering, which appears to work surprisingly well. Very few users reported this cleaner missing spots. 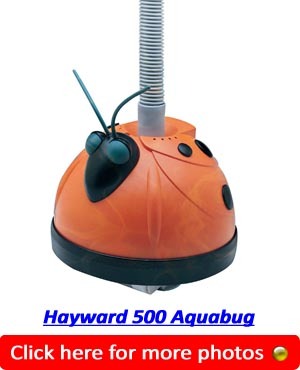 The Hayward Aquabug is one of the few pool cleaners that will pick up sand and fine particulates straight out of the box. There is no need to buy any special filters. Provided you have a good level of suction, you will have no issues with dust or dead algae. Refreshingly, you can plug this cleaner into the skimmer. Something that a lot of users find far easier than having to crouch down at the edge of their pool to reach into the water and plug the hose into the outlet. It appears to cope well with little bumps and wrinkles. Again, something that not every pool vacuum does well. However, not everyone found this device effective. Some people had to buy a separate adapter to get it to work. Others found that it was fine for a few minutes and then started sucking in air and not moving. To work it needs the right amount of suction. But, if your pump is too powerful it will have a tendency to tip over in the pool. If you like the sound of this vacuum, but do not fancy having a bug-shaped cleaner crawling around your pool just choose another shape. It is also available in a whale shape and another cute design. However, some users said that the tail of the whale-shaped one tended to get stuck on the ladder and it kept falling off. This is not strictly an automatic above ground pool vacuum, but we have included it here because it is certainly an alternative to using the traditional manual pool cleaner. It is quite an innovative product that gets around a couple of issues people have when cleaning their pool. You have to do the cleaning yourself, just as you would with a traditional manual pool vacuum. However, there is no leaning into the pool to plug the hose into the inlet, while trying not to get your clothes wet. Plus, you do not have to wrestle with a 30+ foot hose, no hose is needed. Importantly, you do not have to worry about whether there is enough suction. Even if your pump is weak, you can still clean your pool effectively. It comes with a 94-inch extendable aluminium pole. You can add extra length using the Intex telescoping poles if you need to. 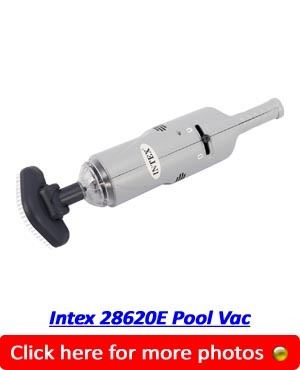 Plus, if you have a hot tub you could also vacuum it using the Intex 28620E handheld rechargeable pool cleaner. So far, so good, the concept is excellent, but there are problems. This device picks up dirt well but does not always cope with larger items like leaves. Plus, if you are using it to clean a very dirty pool you are going to have to stop and empty the cleaner several times. The other big issue is the battery life. They do not last long and the device takes several hours to charge, so if it does run out you may have to finish the job the next day. Some users reported that after a few months the USB charging port went rusty and the device would not charge anymore. In fact, quite a few users reported problems after just 3 uses. The concept is a great one, but this product would benefit from a bit more development. Looking for more cleaning tips and ideas, checkout ShowHomeStyle.com.